Horizons students practice basketball skills with UM Women’s Basketball players. 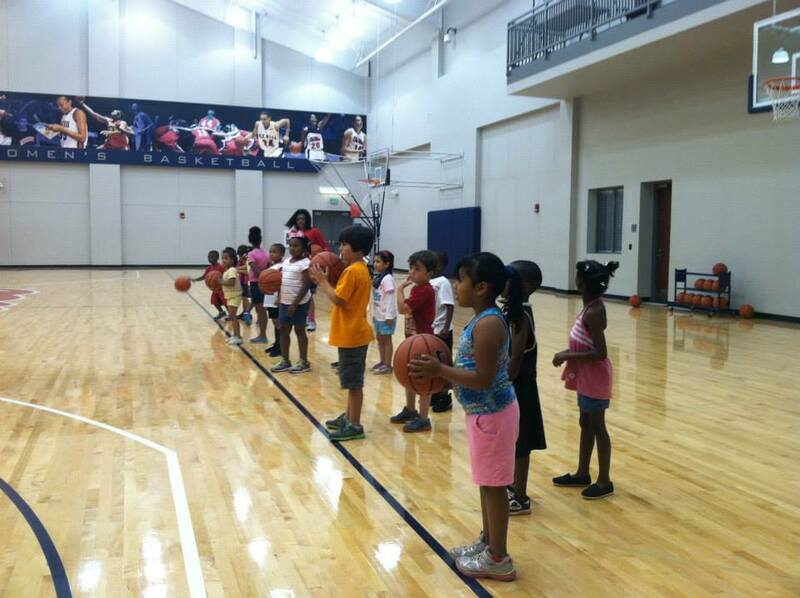 The Ole Miss women’s basketball team opened up the Tuohy Center and put the participants in Ole Miss’ Horizons Summer Learning Program through some drills on Friday (June 27) morning. The Rebels hosted three groups of students ranging from rising first graders to rising third graders who are participating in the Horizons Summer Learning program through Ole Miss’ McLean Institute. Members of the basketball team, coaching staff and managers put the children through drills focusing on passing, shooting and dribbling. The Horizons Summer Learning program in Oxford is in its second year of existence and partners with students from Bramlett and Oxford elementary schools to sponsor a summer learning program. The program, in conjunction with the McLean Institute and Horizons National, battles summer learning loss. Horizons affiliates challenge children academically, social and physically, inspiring them to become life-long learners. This year, the program has 45 students which includes rising first graders through rising third graders. The six week program partners with the school district and the United Way for funding and features techers from both Bramlett and Oxford elementary schools. In the first year, the University of Mississippi hosted 30 rising first and second graders for six weeks, offering academic program, swimming lessons, art activities and field trips around campus. Teachers from Bramlett Elementary School with support from University staff and volunteers direct all academic programs offered. This year, the program expanded to include rising third graders and will eventually serve students in first through eighth grade. The mission of Ole Miss’ Rebel Ready Program is to challenge the student-athletes to be lifelong learners while pursuing continuous improvement academically, relationally, socially, personally, and professionally during and beyond their careers as student-athletes. Rebel Ready is the hub for a wide range of Ole Miss Athletics sponsored programs designed to meet the needs of student-athletes and their families. It is divided into six areas: Student-Athlete Assistance Services, Career Development, Continuing Education, Community Outreach, Financial Education and Career Transition. Visit Rebel Ready for more information on Ole Miss’ Rebel Ready program.